It’s so easy in our modern world to take for granted the ingenuity and talents of those who came before us. Let's say you want a festive shirt for your uncle’s Hawaiian pig roast, or an eye-catching floral dress for that garden wedding. You just hop in your car and drive to the nearest mall, where you find a mind-numbing array of choices. Aside from staring down that unforgiving mirror in the fitting room, the most difficult part is remembering where you parked your car. 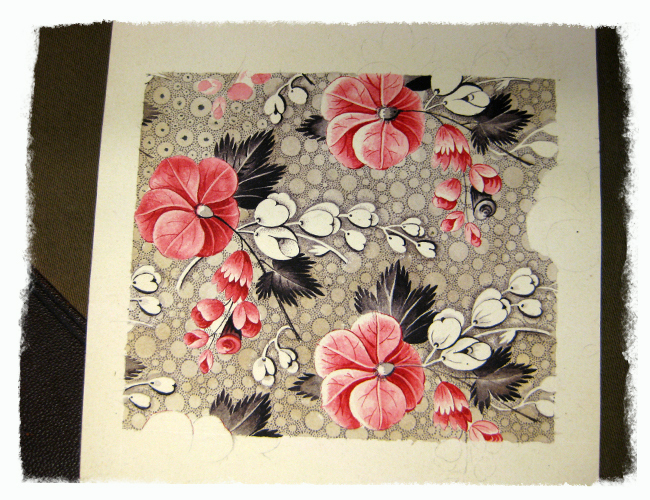 Of course, there has not always been such an abundance of printed fabric for the choosing. It took centuries for techniques and production levels to evolve to what they are today. Recently, I was able to step back in time during a visit to the historic Slater Mill in Pawtucket, Rhode Island, where I learned a bit about early textile production. Slater Mill began as the first successful cotton-spinning factory in the United States constructed to run by waterpower. 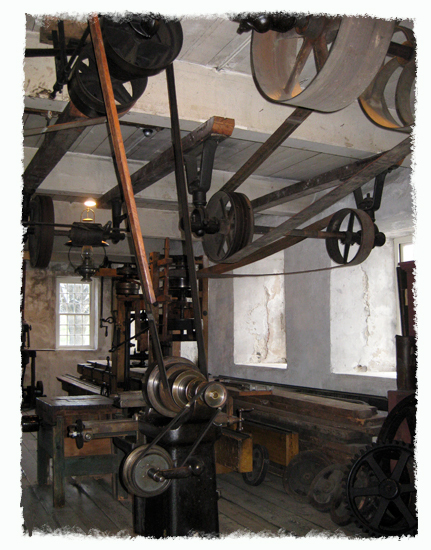 It saw many forms of manufacturing and production through the years before becoming an industrial museum, and ultimately, a National Historic Landmark. 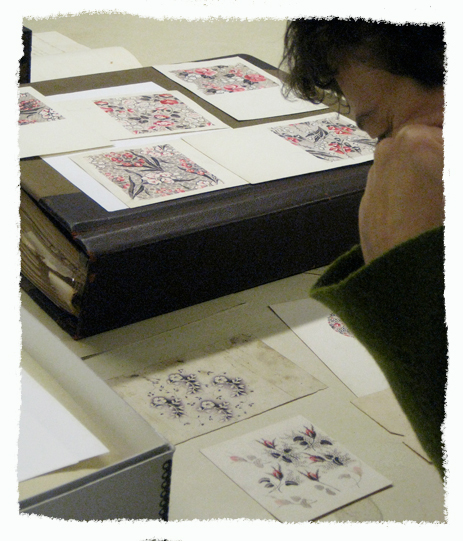 After a tour of Slater Mill’s various buildings, I and the rest of my cohorts in a surface design group I belong to, were treated to a private viewing of calico print designs from the archives. 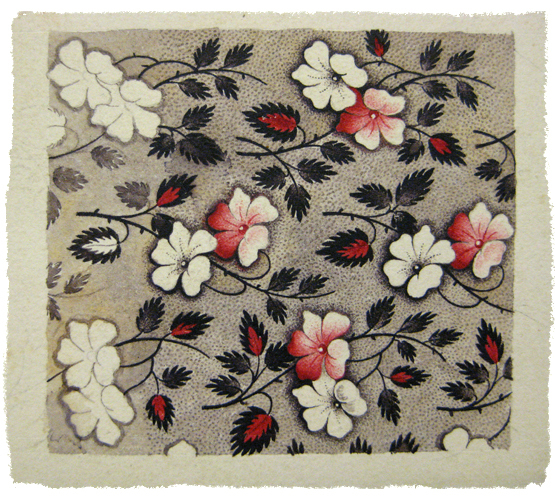 “Calico”, if you are not familiar with the term, basically means fabric with a small, all-over floral print. These designs were all hand painted by John Street, the official artist and engraver for J. Dunnell & Co., a fabric printing company that existed in the early to mid 1800’s. As our guide carefully unwrapped each sample, we let out our collective 'oohs' and 'aahs', marveling at the meticulous and rich detail. 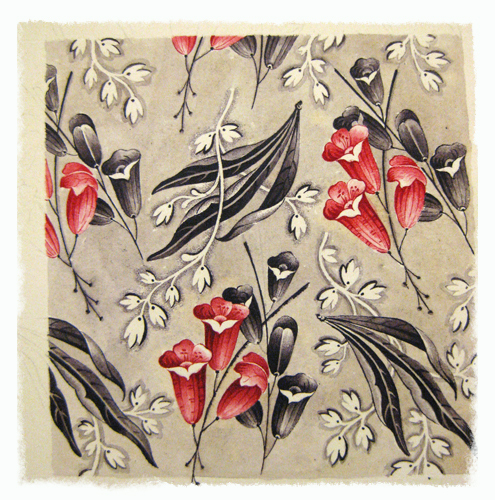 Though beautiful, these renderings were only the first step in the creation of the calico fabric. 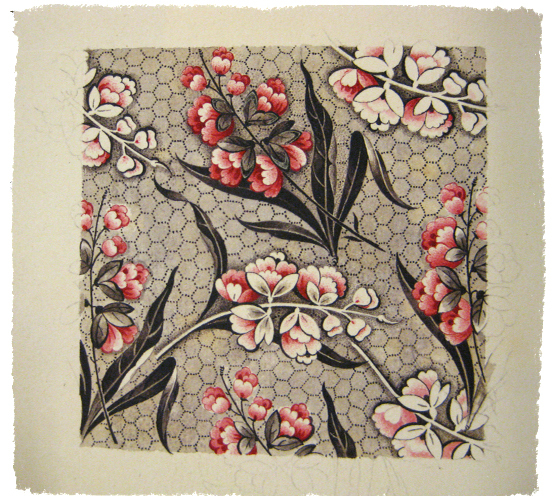 Next the designs would be engraved onto a copper roller, which when inked, would print the design continuously onto the fabric. 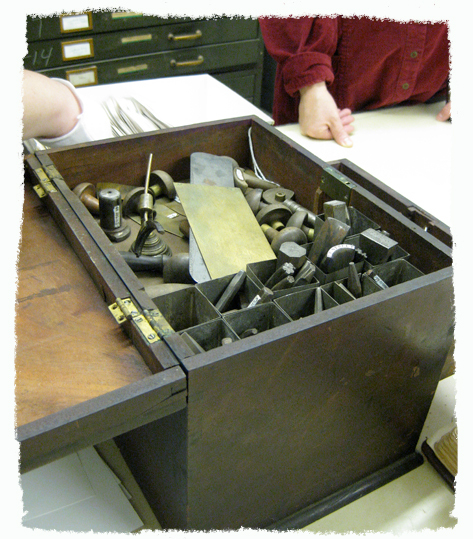 This technique was patented by Thomas Bell in 1783, and was a major improvement over previous methods, which included printing with carved wooden hand blocks and large engraved copperplates. 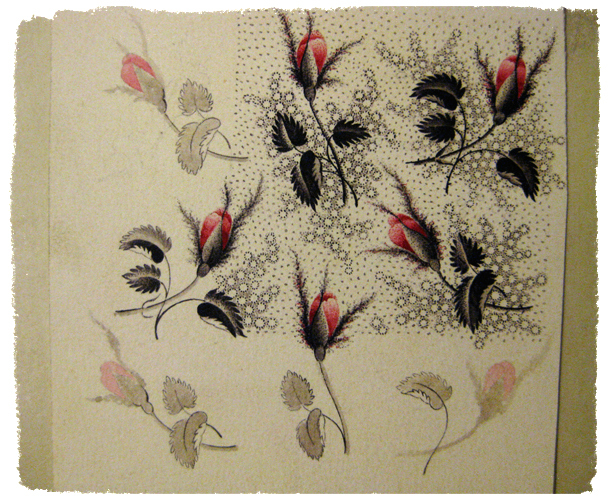 As this technique developed, more and more colors were printed simultaneously, further accelerating production. Today the most common technology used for textile production is screen printing, either rotary or flatbed, though digital printing of fabric is fast evolving as the next new frontier. Another aspect of textile production that is easily taken for granted is the creation of the ‘repeat’. This is a single design unit or 'tile', that when placed edge to edge, or staggered as a 'half drop', forms a seamless pattern. Done well, you don’t notice where this single unit begins and ends (unless you look for it), and there are no odd gaps or awkward spacing. Achieving this is a bit of a puzzle. If you look closely at these photographs, you can see that John Street was working out how his designs would repeat. You will often see motifs duplicated exactly (or nearly so), on either the horizontally or vertically axis. Then along the edges, there is often a light pencil outline showing the continuity of the repeat. My fascination with repeats began while creating patterns for my jewelry, which I would silkscreen onto large sheets of metal. Longing to make my patterns more complex, I spent hours figuring out how to go about it, and would often end up scratching my head. Though I knew there had to be some kind of tricks-of-the-trade, I forged ahead trial-and-error style. Finally, years later, I took some Surface Design classes at RISD Continuing Ed, under Adrian Burke, a very talented artist and textile designer (also the leader of our awesome surface design group). Through her I learned how to create repeats both manually and digitally. Now that I have some of those “tricks-of-the-trade” under my belt, I am currently creating colorful patterns for Red Bubble, an online print-on-demand company that offers a wide range of products. It is pure magic to see my designs come to life. Well, I hope you have enjoyed this glimpse into textile history. As is often the case, there is more to it than meets the eye! 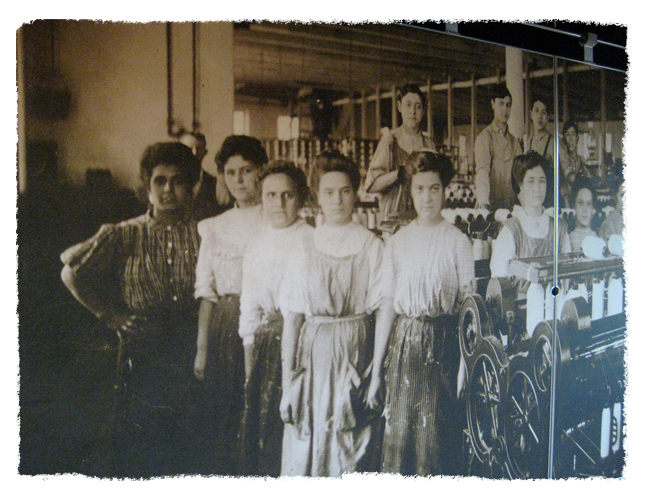 I leave you with this haunting mural from Slater Mill of workers who paved the way in the early days of textile production. To see more photos from Slater Mill, visit my Pinterest Board. Hop on over to my Red Bubble Shop, to see some of my pattern designs. Thank you Lynn for sharing your experience with The Surface Design Group/Adrian Burke and the trip to Slater. 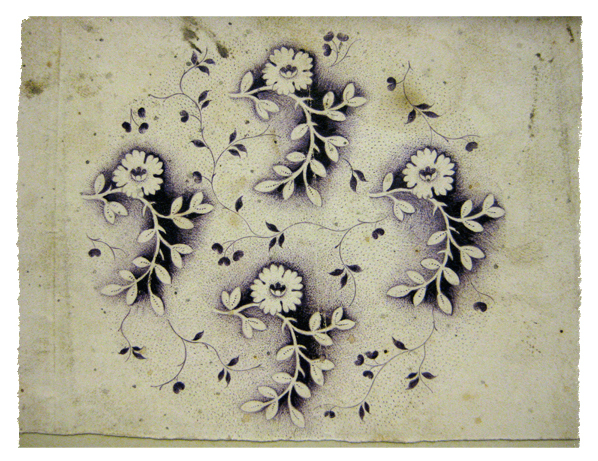 Those vintage documents/paintings of the Calico Prints are just exquisite!!! Really enjoyed reading and viewing. I'm so glad you enjoyed reading this. Thanks for commenting!